The Azadi Tower (Persian: برج آزادی‎, Borj-e Āzādi; "Freedom Tower"), formerly known as the Shahyad Tower (برج شهیاد, Borj-e Šahyād; "Shah's Memorial Tower"), is a monument located on Azadi Square in Tehran, Iran. It is one of the landmarks of Tehran, marking the west entrance to the city, and is part of the Azadi Cultural Complex, which also includes a museum underground. The tower is about 45 metres (148 ft) tall and is completely clad in cut marble. It was commissioned by Mohammad Reza Pahlavi, the last Shah of Iran, to mark the 2,500th year of the foundation of the Imperial State of Iran. After winning a competition, architect Hossein Amanat was tasked to design the tower. His ideas were based upon classical and post-classical Iranian architecture, popular influences on art in the 1960s following the White Revolution. Iran's increasing wealth sparked modernization programs and sent the art industry into a renaissance-like period. The first name associated with this monument was Darvāze-ye Kuroš ("Gate of Cyrus"), and at the time of the Centenary Celebrations, Asadollah Alam, who chaired the Council of Celebrations, referred to the monument as Darvāze-ye Šāhanšāhi ("Imperial Gate"). The monument's ultimate official name was decided before the announcement of the competition for the monument's design in September 1966. Bahram Farahvashi, a scholar and professor of ancient Iranian languages who worked with the Council of Celebrations, came up with the officially designated name of the structure, Šahyād Āryāmehr. Built in 1971 in commemoration of the 2,500th year of the foundation of the Imperial State of Iran, this "gateway into Tehran" was named the Šahyād ("Shah's Memorial") in honor of the Shah (Mohammad Reza Pahlavi), but was later renamed Āzādi ("Freedom") following the 1979 Revolution. 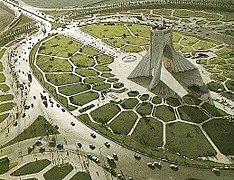 Plans of the Azadi Tower. During the 1960s, Iran became a major oil-exporting country, and using the newly-found wealth, the shah launched programs to modernize and industrialize the country. This followed a cultural growth that architect Hossein Amanat describes as "a mini renaissance". In 1966, Amanat won a competition to design the building. Due to governmental concerns, Amanat was required to sign underneath contracts "on condition of the approval of the Council of Celebrations", which would serve as the client. Amanat planned to contract the British company of Arup to assist in the structural design of the tower, as he was impressed by their contributions towards the design and construction of the Sydney Opera House. He initially faced opposition from the head of the council, as well as several conservative and nationalistic Iranian engineers, as he was turning to a foreign engineer for assistance. Despite that, the shah supported Amanat, sending a letter to the council which would leave the decision to the architect. Shahbanu Farah Pahlavi was also supportive of Amanat's decisions. Amanat told the BBC World News in an interview that "overall, the building starts from the base and moves up towards the sky." He states that he was inspired to design the tower in this way because he felt that Iran "should be moving towards a higher level." According to him, the main vault is a Sassanian arch representing the classical era, while the broken arch above it is a popular medieval form of arch representing the post-classical era. The "network of ribs", which connects the arches together, would represent the connection between classical and post-classical Iran. Built with white marble from Isfahan Province, the monument includes 8,000 blocks of stone. The stones were all located and supplied by Ghanbar Rahimi, who was well known for his extensive knowledge of quarries, often known as the Soltān-e Sang-e Irān ("Iran's Sultan of Stone"). Computers were used to "define its complex woven surfaces," which, at the time, was a new technological technique. The main contractor for the construction of the tower was the MAP Company, supervised by Ghaffar Davarpanah Varnosfaderani, a renowned Iranian stonemason. The project was mainly funded by a group of five hundred Iranian industrialists. According to a report by MEED, the construction costed about six million dollars. On October 16, 1971, the inauguration of the tower took place. However, it was not until January 14, 1972 that the tower was open to the public. The iconic Martyrs' Memorial in Algiers, which was built in 1982, shows a strong influence by this monument. The Azadi Museum is located on the basement floor. Inside the floor, there are black austere walls and proportions, and a concrete mesh forms the ceiling. Heavy doors open onto a crypt with subdued lighting issuing from showcases, each containing an object. The museum houses a number of gold and enamel pieces, painted pottery, marble and paintings. Approximately fifty pieces have been selected, each representing a particular period in Iran's history. Among the earliest items on display were square flagstones, gold sheeting, and terracotta tablets from Susa covered with cuneiform characters. Before the 1979 Revolution, the main display was occupied by a copy of the Cyrus Cylinder, the original being kept at the British Museum. A translation of the cylinder's cuneiform inscription is inscribed in golden letters on the wall of one of the galleries leading to the museum's audio-visual department. A similar plaque facing the cylinder listed the Twelve Points of the White Revolution. Next, to the Cyrus Cylinder, there was a gold plaque commemorating the original presentation of the museum to Mohammad Reza Pahlavi by the Mayor of Tehran. Potteries, ceramics, varnished porcelains (such as a seventh-century blue and gold dish from Gorgan), an illuminated Quran, and miniatures highlighted milestones in the country's history up to the 19th century, which were represented by two painted panels from Empress and the structure was to represent Farah Pahlavi as in is stated in some ancient texts. The original show, devised in 1971, was replaced in 1975 by a new one which invited visitors to discover Iran's geographic and natural diversity along with its fundamental historical elements. It exhibited a number of national achievements, technical undertakings, calligraphed poems, and miniature paintings. The project, devised by a Czechoslovak company, required 12,000 metres of film, 20,000 color slides, 20 movie projectors, and 120 slide projectors. The audiovisual programmes were directed by professor Jaroslav Frič (1928–2000). Five computers operated the entire system. German artist Philipp Geist organized a projection mapping installation named Gate of Words at the Azadi Tower, on the occasion of the German Unity Day. The show was held from October 3 to 5, 2015. In this project, the artist visualized the topics of freedom, peace, space and time in a poetical manner. Geist developed a light installation made of colored words and concepts in different languages, and abstract painterly compositions of images. The glowing words were in English, German and Persian, moving in sync with live music on the walls of the tower. The observation deck of the Azadi Tower. Entrance of the Azadi museum. Wikimedia Commons has media related to Azadi Tower. ^ "Yahoo News - Latest News & Headlines". news.yahoo.com. Retrieved 1 September 2015. ^ Hureau, Jean. Iran Today, 2nd. Ed, editions j.a. ^ "BBC فارسی - ايران - 'برج آزادی پس از۲۰ سال شسته می شود'". BBC Persian (in Persian). Retrieved 1 September 2015. ^ a b Khashayar, Hemmati, (2015-08-20). "A Monument of Destiny: Envisioning A Nation's Past, Present, and Future Through Shahyad/Azadi". summit.sfu.ca. Retrieved 2016-02-28. ^ a b Riazati, Rozita (14 January 2016). "The man behind Iran's most famous tower". BBC News. Retrieved 22 February 2017. ^ "Hossein Amanat with Benjamin Tiven". Bidoun. Retrieved 24 May 2015. ^ Amanat, Hossein (January 14, 2016). "The Freedom Tower in the name Ayush patel Tehran". Witness (Interview). Interviewed by Rozita Riazati. BBC World Service. ^ "AMANAT ARCHITECT - SHAHYAD MONUMENT". www.amanatarchitect.com. Retrieved 20 February 2017. ^ Grigor, Talinn (2003). "Of Metamorphosis Meaning on Iranian Terms". Third Text. 17 (3): 207–225. ^ "MEED". Middle East Economic Digest. 15. 29 October 1971. ^ "Iran Travel Photos. Tourism pictures from Iran - CountryReports". www.countryreports.org. Retrieved 20 February 2017. ^ The Guardian: German artist lights up Tehran's freedom arch – in pictures. 7 October 2015. ^ Philipp Geist was invited by the German Embassy to propose such a project at the occasion of the 25th anniversary of the German Reunification.